In the News - Best of Oakland and Feature in Quilting Magazine! Highlighting our work with youth at Lighthouse Middle School, Oakland Magazine recently named Vision Quilt as the city's 2019 "Best Violence Healing Project." We are honored to receive this recognition of our work. Vision Quilt director Cathy DeForest spent the winter in Oakland, deepening our alliances connections with various nonprofits and community leaders throughout the city – as these developments continue, stay tuned for new announcements. We are thrilled to work in such a vibrant city and alongside so many inspiring community organizations and youth. In other news, Vision Quilt was featured in an article by Pam Rocco for the April/May issue of Quilting Arts Magazine. We are thrilled to receive such support from the quilting community, and we hope many magazine readers are inspired to create their own Vision Quilts! In the United States, 735 people die in the from gun violence each week, reports the Center for Disease Control. In March, youth from March for Our Lives created a powerful art installation and memorial to personalize this tremendous statistic. Staged on Capitol Hill in Washington, D.C., "A Week in America" visualizes these deaths with a memorial marker for each individual. Each week in the United States, fifteen children are killed by gun violence. To reflect this reality, "A Week in American" depicts a student sitting at a school desk. But the student's face is replaced by a mirror -- the installation asks each viewer to reflect on their own role in preventing gun violence. The installation asks, What are you doing to prevent gun violence? To learn more about "A Week in America," watch this short video produced by Now This. We applaud and support the March for Our Lives youth for their courage, tenacity, and lucidity -- they are powerful leaders in a much needed movement. Vision Quilt Brings Power to the Polls: November 6! This 2018 midterm election season, Vision Quilt has been active in supporting youth groups in getting out the vote. The youth led Empower Coalition is shaping a new future by bringing their #PowerToThePolls. Under the umbrella of the Women’s March Youth Empower, Vision Quilt is collaborating with over 100 organizations and youth groups to address critical issues on this year’s ballot. Youth and college toolkits were offered to encourage students to launch voter registration drives on their campuses. Working through a national online network, the Empower Coalition created teams to develop a strategic social media campaign. Our goal is to encourage young people to learn more about areas of legislation that will affect their future. Along with the Brady Campaign to End Gun Violence, MOMS Demand Action, Students Demand Action, Giffords Courage Campaign and the Parkland students’ #Road to Change, Vision Quilt promoted voter registration and education on legislation around gun reform. 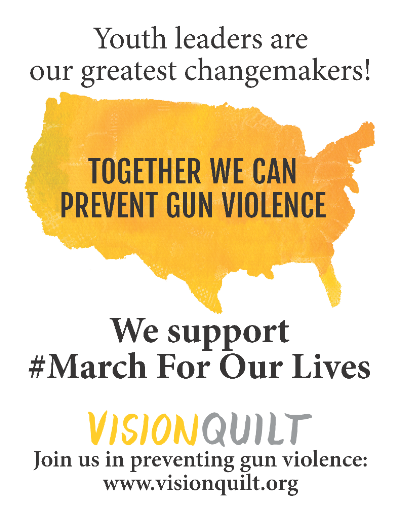 Vision Quilt is a non-partisan organization, but we are committed to preventing gun violence and youth empowerment. Team Enough is creating an inclusive platform for young people to speak out about gun violence prevention. Visit https://www.teamenough.org/who-we-are/ to learn more about Team Enough and the work they are doing to challenge gun violence in America. Vision Quilt urges people of all ages to go the polls to vote for Gun Sense candidates. Over 2,200 Gun Sense candidates are on the ballot on November 6. 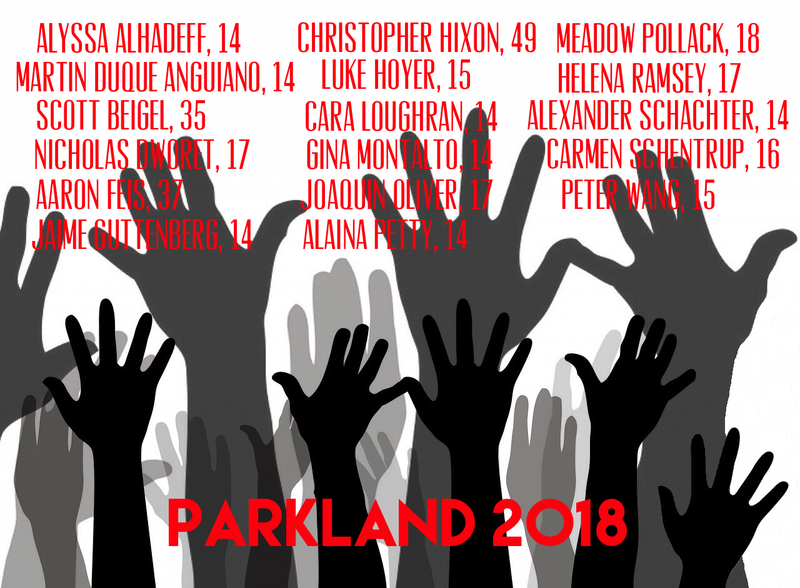 ​PLEASE VOTE- we need to elect candidates who will commit to end gun violence. On July 22nd, Vision Quilt joined over 300 other Bay Area residents and activists at the Road to Change BBQ Rally, in Oakland, CA. Cathy DeForest and our team of Bay Area volunteers displayed Vision Quilt panels on the grass in DeFremery Park. People gathered around to ask questions about the artwork and many were eager to get involved, including the Bay Area alumni from Marjory Stoneman Douglas School. Vision Quilt panels on display in DeFremery Park, in Oakland CA. Cathy DeForest, talks with youth leader, Alex King. They will continue their national campaign through mid-August. Vision Quilt looks forward to meeting again with the core members of this powerful youth-led movement this September for a Brady Campaign fundraiser. Students getting off the Bus for the Road to Change Rally in Oakland, CA. Vision Quilt is featured in the upcoming Studio Art Quilt Associates (SAQA) exhibition, Guns: Loaded Conversations. The exhibition premieres on April 20th at the San Jose Museum of Quilts and Textiles, with an opening reception on April 22nd. A traveling exhibition, Guns: Loaded Conversations will be exhibited around the country for the next three years. Our director, Cathy DeForest, has returned from her trip to Chicago, where she met with many brilliant community members, activists, and other leaders focused on preventing gun violence. A highlight of the Chicago trip was the Vision Quilt workshop held with Valerie Goodloe at the ARK of St. Sabina, an important community center overseen by Father Michael Pfleger. Valerie's program, W.I.N.D.O.W. (Women In Need Of Discovering Own Worth) integrated Vision Quilt into the ARK's five month mentoring program for girls ages 13-17. At the ARK workshop, many of the participating youth had just returned from the March For Our Lives rally in Washington, D.C.
Father Pfleger and Arne Duncan, the former US Secretary of Education, along with community activist Pam Bosley, reached out to the Parkland youth after the mass shooting there. At the invitation of Emma Gonzalez's mom, teens from Chicago's South Side visited Parkland, where the two groups formed a strong connection. The Chicago youth then invited the Parkland youth to visit Chicago; the New York Times produced a powerful short film about this meeting. Rie'Onna Holmon, who is featured in the Times video was also a participant in the ARK's recent Vision Quilt workshop. Later this month, Cathy DeForest will travel to Portland, Oregon, where she will participate in community workshops centered around the National School Walkout on April 20th, which commemorates 19 years since the Columbine school shooting. Cathy will also present at the Cultivating Community conference, an arts therapy conference hosted by Marylhurst University in collaboration with the Portland Creative Arts Therapies Association and Returning Veterans. As part of the Nationwide Vigil to End Gun Violence, Vision Quilt will host a local vigil at Sew Creative on December 3, 2017, from 2PM to 4PM. Beginning as a tribute to the victims of the Sandy Hook tragedy, the annual vigil has become a nation-wide time of remembrance and gathering to honor all victims of gun violence. Since 2012 more than half a million Americans have been injured or killed by gun violence. The local vigil at Sew Creative will be a time to honor, remember, and reflect all those impacted by gun violence. At 2:30PM there will be a formal reflection and discussion. The focus of the vigil is not political, but rather will provide space for anyone impacted by gun violence to reflect, grieve, and connect with others. The Nationwide Vigil to End Gun Violence is organized by the Newtown Foundation, the charitable arm of the Newtown Action Alliance, and numerous partner organization. In 2016 there were 330 related vigils and events across the country. This year the Newtown Foundation’s main vigil will be held on December 6 at St. Mark’s Episcopal Church in Washington, D.C. The local vigil will be held from 2PM to 4PM on Sunday, December 3rd, at Sew Creative, 115 E Main St in Ashland, Oregon. The event is free, and all are welcome. The gathering will be hosted by Vision Quilt, whose mission to empower communities nationwide to create their own solutions to gun violence through the power of art and inclusive dialogue. Questions about the local vigil can be directed to Rachel Lee, lee.rachvq@gmail.com. One of the key inspirations for Vision Quilt is the work of the Cure Violence, founded by epidemiologist, Dr. Gary Slutkin. According to Cure Violence, the issue of violence prevention should be treated like a contagious disease. They use a model in which they detect and interrupt violent conflicts and use outreach workers to identify those at highest risk to reach and maintain a non-violent path to conflict resolution. Furthermore, Cure Violence engages communities in rejecting the idea of violence as an acceptable behavior to resolve conflict. Vision Quilt celebrates the international success of Cure Violence and encourages communities to adopt their model to help prevent violence. "Let America Be the Dream the Dreamers Dreamed"
We at Vision Quilt are deeply concerned by the recent emboldening of white nationalism, neo-Nazis, the Ku Klux Klan, and other hate groups in the United States. In the wake of Charlottesville, awareness of such extremism has been a topic of national conversation, but racial violence has long played a shameful yet significant role in U.S. history. We must work to ensure that this 21st century offers a legacy different from our past. Like the message found in many Vision Quilt panels, we must summon the power of love. We must seek guidance from our hearts, heal our personal and cultural wounds, and create the great nation of unity, acceptance, and love for all.